Streaming audio player animation using modern CSS animations, transforms etc. An HTML5 audio player with a play list and using Font Awesome to create a custom player interface. Custom seek/progress bar included that allows you to seek positions. Using Archive.org as my audio source. clicking around the menus and playing a song. Simple Beautiful Fully Functional Music | Audio Player. 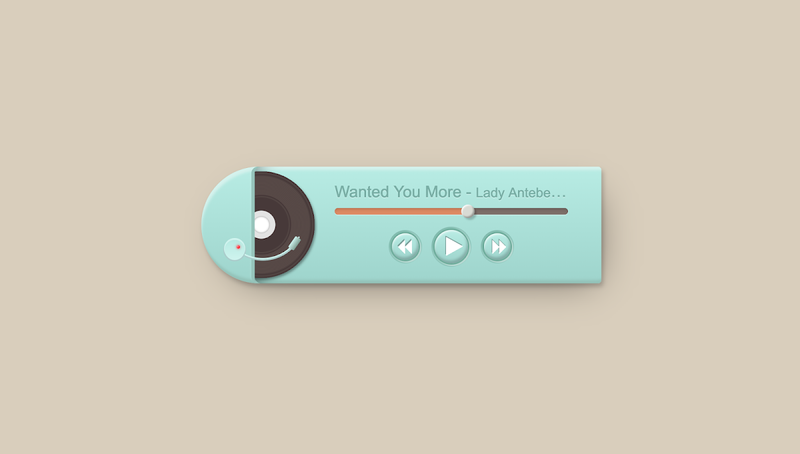 Minimalistic music player design. Hover to see the controls! Toggle between play and pause button. Material Music Player is based on HTML5, CSS3 and jQuery. Music player with pre defined play list. Press "play" and see the vinyl animation ! Made with js. Design a slick music player UI, then use the Web audio api to expose frequency data to D3.js, allow me to build sweet audio visualization! A Simple Music Player Build With React.js. This Music player is built with React using NPM and Node.js. Chrome App music player that is designed to be floated on top of other applications while remaining minimal. It is full functional, with an easy to manipulate playlist of songs. There is a set of five songs in the playlist already, to show off the functionality of the player but you are more than welcome to add, rearrange, remove, etc. the songs.